Every couple dreams of a wedding day that is unique and creative. 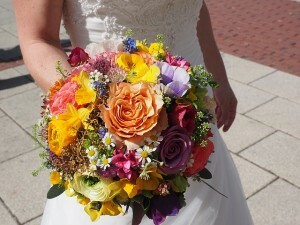 Colors play a huge role in enhancing the overall mood and effect of this special day. Unfortunately, choosing the right colors for your wedding isn’t as easy as it seems. 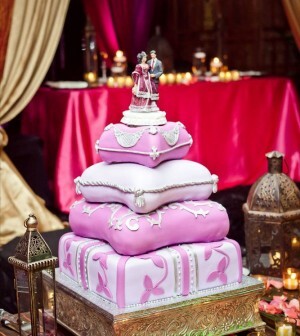 Although you may have certain favorite colors, you cannot simply put them together and plan your wedding around them. Wedding color pitfalls are fairly common, and they ruin the wedding ambiance. Fortunately, being aware of the likely mistakes will help you avoid them. Here is our guide to the common mistakes couples make when choosing wedding colors. Use it to steer clear of a visual overdose of colors and mix and match combinations that do not gel together. Many couples forget to account for the effect of the colors that are part of the venue they choose. 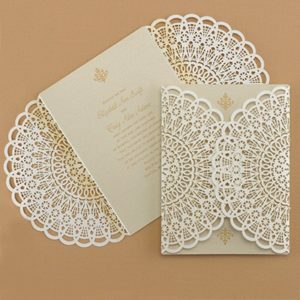 This unavoidable part of the décor has to be considered and you should work it into the wedding color palette. 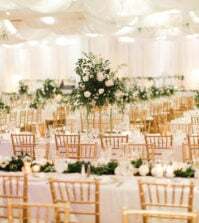 Since it is unlikely that you can alter any of the existent colors at your venue it is wise to pick colors that do not clash with them for the best effect. If you already have made your decision about the colors that will be in your wedding, choose a venue with colors that work with your choice. 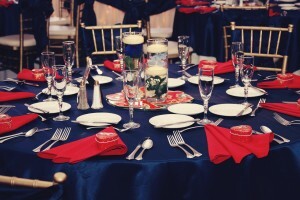 There are many venues without dominating colors in the décor. Pick such venues and you will not have to worry about a likely clash of colors. Otherwise, find your wedding venue first. Then pick your wedding colors to go with it. However, this means that you will have to be open to options and flexible with your choices. When you are a lover of colors, it can be difficult to narrow down your choices to just few. Nevertheless, don’t make the mistake of working with many colors that are entirely different. Multiple bold and dominating shades create clutter and look messy. Also, the individual details will be lost in the noise. This article on the Brides website suggests that where colors are concerned, fewer is better. If your theme requires you to work with multiple colors, say like a rainbow or circus theme, try to work with smaller doses of color. Then use a neutral base to tie the effect together. This article also suggests limiting your colors to just two for elegance and sophistication. Make sure that these colors complement or contrast, for it to be pleasant and not overbearing. As a general rule of thumb, do not add more than four colors to your palette, or it can become overwhelming. Pantone picks a color or two every year, and many brides decide to incorporate this into their weddings. From burgundy to rose quartz and greenery, the choices are often unusual and unexpected. This may seem to be unique and interesting at the time. One advantage of using these colors is that it is easy to find your wedding decorations. Many companies bring out décor items in this color following the announcement every year. However, not all such trends are timeless or classic. 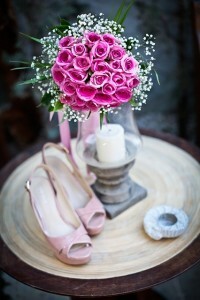 When you choose an unexpected combination for your wedding, it is likely to look dated over time. Although it may look interesting at the moment, remember that your wedding memories should stand the test of time. When your album shows what is hot now, it doesn’t have to be the same years later. Hence it is better to pick colors that actually appeal to you than go with fads that will disappear soon. Classic color combinations and bold, saturated colors will always speak to you. Ten years from now, when you open your wedding album, the colors that you eternally love will seem more attractive than shades whose names you can barely remember at the time. This is the very opposite of working with too many colors. By limiting your wedding day palette to just one or two shades, your wedding can become monotonous and boring. Instead, try to incorporate various hues of the same color into the scheme. Also work with neutrals that don’t overpower with their presence. If your focal colors are really vivid, balance the effect with soft, neutral shades that will add depth to the main colors. If you have choose mute and subtle colors to be highlighted, the right dose of complementing colors will personality and make the décor more interesting. Take a look at the color wheel to find colors that contrast or complement well with the main colors you choose. Use this to plan your color combinations wisely. Here is a comprehensive guide to working with colors, on the Smashing Magazine website. Take a look and we are sure you will find plenty of inspiration and ideas. Certain color combinations are safe, however they are also boring. We have seen enough weddings where black has been paired with white and gold, or red with yellow and white. These predictable combinations no longer excite, and have little scope for creativity. So, while you should find inspiration in traditional combinations, it is a good idea to tweak the colors and with your own creative twist. One of the ways to do this is to take such a palette, and switch out one of the colors. Choose a hue from the same color family, but one that is distinct. Another option is to break the pattern with luxurious doses of white or black, which also creates a sophisticated effect. You can also use metallic colors for an interesting effect. The right doses of gold, silver or copper can instantly glam up a color palette, and add to its elegance. While carefully matched colorful pieces will look stunning in your wedding décor, it should flow naturally and look effortless. Trying too hard to get the colors right and the combinations perfect will ruin the entire effect. This is especially true where floral elements and bridesmaids dresses are concerned. It may not be possible to find flowers in the exact color you want for your wedding palette. You may end up having to spend extra for off-season varieties if your chosen color is rare, like shades of blue. Similarly, picking bridesmaids dresses in colors that match your palette aren’t a good idea if it won’t look good on your bridesmaids. This will not only make them unhappy, it will also be an eyesore. The trick is to think creatively, and make these details work with a little flexibility. Choose décor items like ribbons, balloons or candles to replace flowers, but obtain the intended effect. Similarly, dress up your bridesmaids with accessories like sashes, hair clips or even shoes to add the desired pop of color without ruining the effect. Whether it is your wedding flowers, table linen, invitation suite or bridesmaids dresses, always see the color to determine it is alright. Images of the color on a computer screen or in a magazine can be entirely different from how it looks in person. This is because the color that you see on a screen depends on the light in which the image was taken and any edits that went into creating the image. If you follow this route, it can completely alter the final effect you obtain at the end. For instance, peach or coral may turn out to be pink or orange when viewed directly. Since you will have to match your colors across various aspects in your wedding, it is best to view swatches before making your decision. This way, you can see for yourself if the color is exactly as you intended, and make the right choice. Also, names can be misleading. So, make sure you have a sample of the color to show others, so there is no confusion about what you actually mean. The same color can have different effects depending on the texture of elements used. Items with heavy texture can have saturated effects, while wispy textures reduce the drama associated with a color. Keep this factor in mind when choosing wedding colors. Patterns, prints and embellishments can alter the overall effect of a color. When planning your décor and style, consider how the different textures in the arrangement come together. The right distribution of textures will enhance the depth and drama of designs in your décor. Pay close attention to linens, centerpieces, carpets and wall colors. These are a significant part of the visual imagery and play an important role in determining the overall effect. Some colors are too difficult to look at, and may not be ideal for your wedding décor. These are colors that aren’t usually seen in nature. Neons and fluorescent colors are distractive and not easy on the eye. Avoid such colors or use them in moderation, so your décor isn’t garish. Neons can be overwhelming, unless chosen carefully. However, it is possible to get the effect right if you use them sparingly. If you choose such colors in your wedding imagery, balance it out with neutrals and complementary colors that make it less overwhelming. Limit their use and consider the effect of the lighting in the space to get it right. Neons and fluorescent colors will look better in the evening, than during day. So, make such color choices keeping these factors in mind. Take a look at this article on the Glamour website for some unique and impressive ideas. There is no denying the fact that different colors look best at certain times of the year than others. Bright tropical colors, for instance, look best in summer and spring while bold, dramatic colors look stunning in autumn and winter. Matching the colors to the actual environmental condition at the time can bring out the best effects in them. Use this factor when choosing your wedding palette. Set the right tone for your wedding by choosing colors that work with the atmosphere you aim to have at your wedding. This doesn’t mean you shouldn’t use colors like yellow and orange at a winter wedding scene. Instead, you may have to lighten or intensify the saturation of the colors you choose to suit the scenery. Pick accent colors that will complement your primary choices, as this can make a significant difference to the mood that is created. Choosing wedding colors isn’t easy. 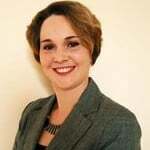 The options are endless, and it is difficult to narrow down choices to few when there are so many attractive options. With each passing day, the ideas keep growing and this only makes the task more difficult. There are many sources of inspiration too. If you just take a look at the internet or flip through a bridal magazine, you will see a stunning variety of ideas. So, how do you make the right choice? As with everything in your wedding, your wedding color palette should reflect your personality, preferences and style in general. Look around you, and to your home and wardrobe as the starting point. This will help you identify colors, textures and prints you already love. Use it to narrow down your choices and just go with what your instinct points you to. The most important thing is not to overthink it, and be happy with what you settle on. We would love to know what colors and ideas you used when planning your wedding. Let us know in the comments section below. Stay tuned to the Best for Bride website for updated offers and deals that will help you have a fantastic wedding day. Also, don’t forget to visit this page regularly for more advice, inspiration and ideas to plan the perfect wedding day. For my wedding, I think that I would like to see the tables filled with colors that do not match up well. Thank you for the tips. Great tips! Thank you so much for the insight. Being creative with themes and colors is not my strong suit!